I thought an Elven mistrel would make an excellent roleplay character, and after a bit of adventuring found they're pretty good for that, too. Below is an image of Curulinde ("Skilled singer"). When he's not poking annoying creatures or evil-doers with a pointy stick, singing and playing his harp (badly), or gazing at the stars (usually at night), Curulinde can be found gazing towards the West and wondering what the folks in Tol Eressëa are having for supper. "I betcha it's bacon and mushrooms!" Last edited by Old_Tom_Bombadil on Wed May 16, 2007 4:51 pm, edited 2 times in total. How did you get that screenshot? Please share ! I'd like to post a picture also ! Press F11 to take the screenshot. You'll get a message with the name of the .jpg when the image has been captured. You can also go to the UI settings in Options to make player names, NPC names, etc. disappear. You can also set it so hats, boots, and/or capes don't appear. That way I can wear an incredibly silly-looking floppy hat with a big feather on it without anyone seeing it. (I'd swear ol' Curlinde looks like a Musketeer with the hat.) Hobbits can also wear their boots yet have that barefoot look that is so popular among the Shirefolk nowadays. I edit (crop, resize, etc.) my images using a program called ACDSee, and save them to my photobucket account. Last edited by Old_Tom_Bombadil on Thu Apr 19, 2007 12:45 pm, edited 1 time in total. I like to make my head gear disappear and I also made that annoying cape disappear. I got sick of it always flapping around. 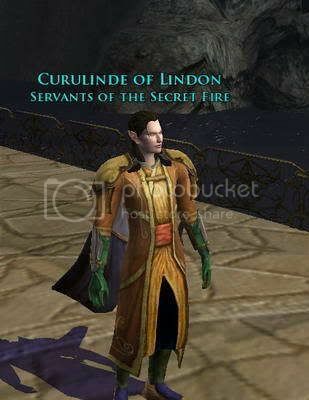 Here's an image of my minstrel character, Curulinde, along with my namesake. Tom Bombadil is indeed a merry fellow. If you're wondering about Curulinde's state of underdress, I'd like to tell you that Old Tom rescued us from the barrow and sent us running naked over the grass, but, unfortunately, that didn't happen. The truth is that my armor (such as it is) was pounded into smithereens by very large spiders as they were feasting on my corpse. But, like the guy who was turned into a newt, I was able to have my clothing and other items repaired so--I got better. Take a picture of me in my glory next time we are on. I'm a bit too lazy to do it myself. I do have couple pictures of Boffo from the back and side not fit for posting. I regret not thinking of capturing an image of him in his Elven Princeling garb. I shall have to remedy that before I venture back to the cold hard lands where I have an ongoing quest to exterminate some rather large insects. Mirgulith, a loremaster of great skill. 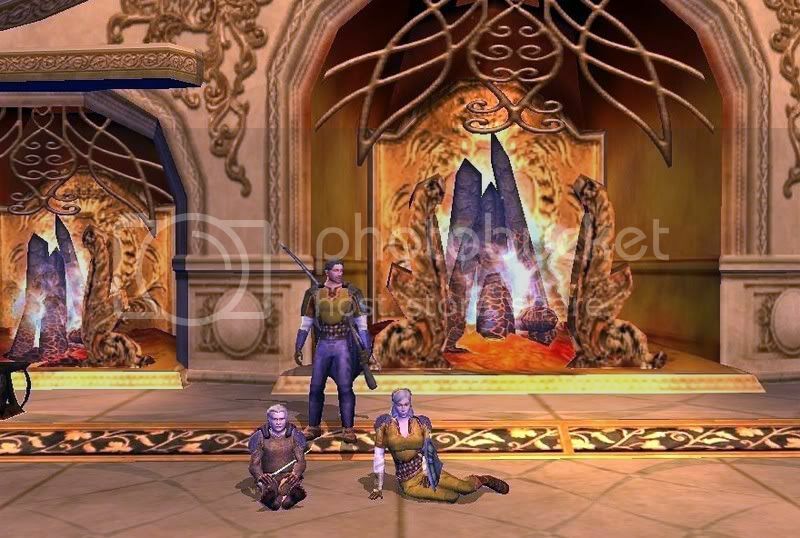 Bilbo Baggins himself agreed to take some time from his busy schedule to take this shot of myself (Athelian), Boffo and Vollund, seen here posing in the Hall of Fire at Imladris. We apparently interrupted preparations for the Council of Elrond, and were asked to leave the area. Elves can be a bit huffy. Last edited by motorwife on Fri Apr 27, 2007 1:33 pm, edited 1 time in total. WHAT!? She went WHERE!? I'll have her axe for this! Visiting "a sick cousin in the Shire", was she? Looks to me as though she's been bounding across the countryside with strange men! Athelian had real fun with Boffo and Vollund. They made the journey to Imladris waaay out of their collective 'toon levels, and faced numerous hazards along the way. They all found that if you're really not supposed to be in an area, the games' servers will send all kinds of nasties out on to the road to chase you! When they arrived, they took a moment to be awed by how well the game designers had envisioned the place, and how deserted it was there. Athelian mentioned to me--rather sadly--that Imladris would never again be that alone and wide open to the three brave explorers, now that the game has opened up and the "power levelers" are at it. Please move this thread to the Kinships forum. Thanks! Last edited by Old_Tom_Bombadil on Mon Apr 30, 2007 10:36 pm, edited 1 time in total. Thrindil the hyper-kinetic Dwarf - "Never have I seen an axe [or mining pick] so wielded"
The ever-flirtatious, Athelian. She wields a big hammer. These are great! I will start dabbling in the pictures more. I took a few the other night, but have not find them on the hard drive. They are to report bugs and not that interesting. However, I will post some soon. Thanks, Tom! I found a stable yesterday offering to take me to Rivendell for a mere 20 silver. As I was feeling rather melancholy, I decided to take the stablemaster up on his offer. Rivendell was refreshingly deserted and I was able to take photos unbothered. Here is one of myself posing with Gandalf and Elrond as they discuss reforging the Shards of Narsil. 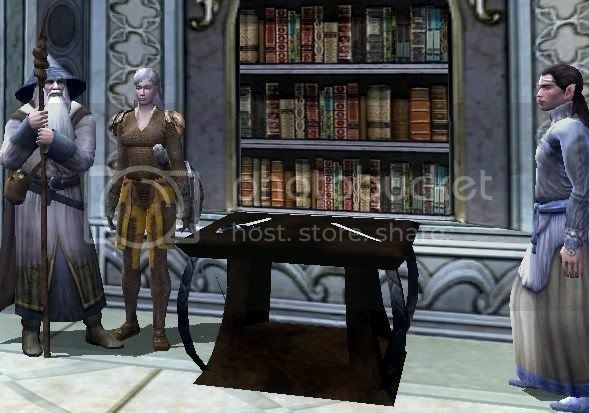 Chief Boffo, and Leaders Vollund and Athelian steadfastly stare at an empty table in the Great Hall of Fire at Imladris. Athelian and Vollund happily and smilingly inhale Boffo's second hand smoke in the non-smoking section of the Hall of Fire. The name's Boffo. James Boffo. Wonderful pictures. I have to go out and buy the game tomorrow - I was a beta-tester, and I really liked what I saw back then. I haven't taken a picture yet, but I will tell you what characters I have come up with when from the dowloaded seven day trial run. I have started adventuring with a Dwarf who hails from the Blue Mountains. His name is Dwergoes and he is a Champion. ( I'm not bragging, that is just the name of his particular character class.) 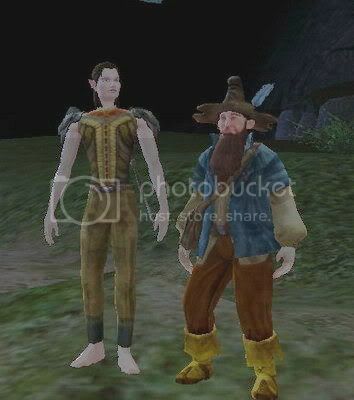 I thought the clothes that Blue Mountain Dwarves are given to wear are alittle woodsy looking. THey are all in shades of green or is this a side effect of living close to Elves. I just thought that my Champion looks strange in this suit. Even the clothes that can be brought at the market in Beregond or BereGost have a very samey appearance about them. Anyway, my character which now sixth level has decided to wear thisi snowy white white Elven cloak and Elven helm combined cloths he started with. As well as pair of leather gloves he retrieved from the corpse of Goblin. He wields two short swords, one in each hand. At the moment I am just trying to raise the forty two coppers to complete one of the first missons I have been given. Until then I'm stuck in this snowy valley surrounded by mountains. I have also made a Hobbit of the Shire. A male Hobbit. A Fallohide, by the name of Everlard, Burglar by profession. ( Yes, I have made obviuos career choices for my characters. If had more time I would be alittle more adventurous.) In the character creation I I gave him a Sam Gangee appaerance with freckly face, ginger hair and very fat. Still at their beginning level. I didn't go far. I took the misson starting at the post office and went outside and allmost ran right into a one of those Black Riders before meeting up with one of the Boffins who was unlucky enought to have encounter the rider. We opened a door and Everlard dispatched two giant Spiders. I then dropped off to sleep at the keyboard and woke up to find that the game must have logged me out after going AFK. Looking at the Hobbit Burglars starting equipment, I am wondering if it's mistake that he is wearing footwear. Of course, I do know that the river hobbits wear boots, but the other two vareities don't. I'm pretty sure Fallohides don't. 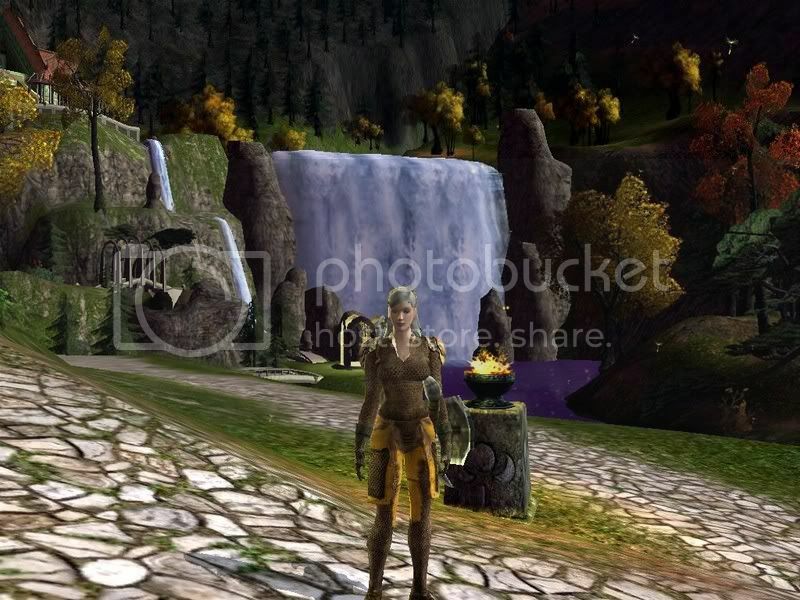 I have also made a Elven Hunter, from Lothlorien. Called Throrathalion. 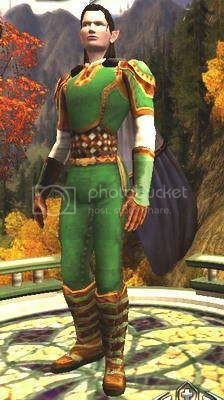 Another male character, who looks abit like Legolas. I made him very slender and have not touched this character yet. I have also made a female human of Rohan, who is a Loremaster. Her name is Mildred. With a freckly face and ginger, blond, brown hair. I have also yet to play this character as well. I will edit this post later with pictures. Last edited by HELMHAMMERHAND on Fri Nov 16, 2012 11:56 pm, edited 3 times in total. Might be be a bit to late for that now. Though, you never know, as I still have another two or three days left on my free trail run of the game. I must say that as I was JADED from my exposure to Everquest Two, I wasn't initially impressed with 'Thorin's Gate' But once you finish the first chapter of quests and your allowed out of snowy valley. It's fricken huge and I still haven't managed to explore all of the 'Valley of the Thrain' and it's immediate surrounding areas. I would love to buy the full subcription just to see it all. I thought all the stuff with the Dourhand's was very cleverly well thought out. I'm disappointed athough the combat system is still alot like other online games. I was hoping they would come up a with better sytem. I might add, here that the class system spoils the realsim. Like walking into the small settlement of Archget and finding the Burglar Trainer standing there as bold as brass on the stairs with the others. Like, really, nobody would admit to be being a burglar or thief trainer. The stealth skill should be more likened to what was done in the 'Thief' game . That would be a very clever implementation. Last edited by HELMHAMMERHAND on Sat Nov 17, 2012 12:00 am, edited 1 time in total. HELMHAMMERHAND wrote: I might add, here that the class system spoils the realsim. Like walking into the small settlement of Archget and finding the Burglar Trainer standing there as bold as brass on the stairs with the others. Like, really, nobody would admit to be being a burglar or thief trainer. And seeing characters run around with their name and kinship name over their head doesn't cut into reality? I have to admit that the RP aspects of the game have deteriorated as time goes on. I'd have to think that Landroval, supposedly the un-official RP server, isn't too much different now than the other servers. There are lots of goofy character names, goofy kinship names, and more gold-seller spammed tells than you can shake a stick at. It's very disappointing. Most of those who do RP seem to do this emote thingy like they're writing a novel or something. Who is the idiot who started this nonsense, and who is responsible for its proliferation? I find it ridiculous in the extreme. RP should be more like acting and less like fiction-writing. My two coppers. As far as Middle-earth goes, the developers have done a fantastic job of melding an RPG with Tolkien's world. I'm sure the purists would wince at a lot of the stuff they see, but I think the developers have done a fantastic job of implementing Tolkien lore. If you're interested in seeing what the future may hold for LOTRO, VisionsoftheRing.com has created a Speculated Expansion Schedule complete with map. We already know that we're getting player housing in October. If the schedule at VOTR holds true, we'll see the Grey Havens with the December update and Lothlorien next April. As the storyline in the game is following the Fellowship, it may be some time before we see Gondor. I have a lifetime subscription so I'll be sticking with the game for awhile. Is the life time subscription one payment and does that still require a monthly fee? If so..... then how much does it cost? A full body glance of the same character with some clothing upgrades after completing the first final misson. Can any guess where he is standing right there. I keep forgetting the name of thsi place as it's not so well known by myself. This last picture here is the first that I took. It's my 10th level Dwarf Dwergoes ( Of the Blue Mountains.) Champion, standing on one of the upper levels of the fortress of Gondamon. I have a few more pictures I'll put up later. The 2nd image was taken in Celondim, or very near there. I was playing Tarkwyn the Lore-Master ( It sounds funny if your a Judge Dredd Fan.) when they booted me out of the game and I had stuffed around ( I had sampled everything barring the Troll on Monsterplay.) so much that I didn't even make it to the Shire and Bree. ( Or any of those other places.) I was on the road between Gondamon and the Elven port Town in the south when it happened. I was making my way close to the Dwarven port vity taken over by Dourhands. As for playing a Rohirrim. I did choose a female Lore-Master also from those lands and took her to ninth level and left her in Comb on Silverlode server. I neglected to take any photos of here or any of the other two characters I created on the Silverlode server and the other three I created on the Landroval server. On MonsterPlay, I created a Warg with a really silly name. Also taking note of the fact that alot of the character likeness's were based on the look from the moviee. ( For instance, The Arwen that appaers in the introductory sequence looks much the same as Liv Tyler without looking exactly like her and yet the Hobbit doesn't look much like any of the four main hobbit characters from the movie.) The Warg's here look alot healthier and less mutated than the ones that I have seen from the Movie. Strange, I thought, the Goblin Riders have some sort of efffect on them. I took photos here and this time I actualley bothered to use the F12 key. Regarding lifetime subscriptions, I know you can still buy one on the Europe servers. It might be worth checking the LOTRO forums or Google to see if they're reinstated it in the American ones as well.